Microsoft is now rolling out new cumulative update KB3206309 for Insiders members on Windows 10 preview build 14986. Insiders will see a new Cumulative Update for Windows 10 Version Next for x64-based Systems (14986) (KB3206309) in their updates. The latest cumulative update brings minor bug fixes and other improvements. 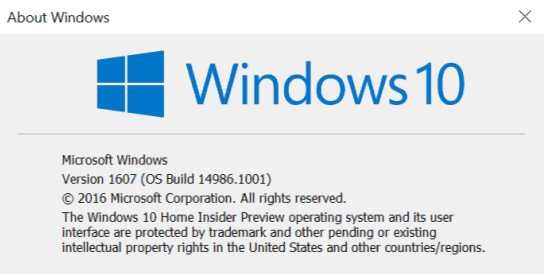 The new update will also push current insider build number from 14986.1000 to build 14986.1001. If you’re an insider member, you can check your updates for Cumulative Update for Windows 10 Version Next for x64-based Systems (14986). You can also download offline standalone update KB3206309 installer from the link below. Recently, Microsoft also released cumulative update KB3206632 build 14393.576 for PC and mobile build 10.0.14393.576. If your update stuck, fail to install or ‘no internet connection’ issues appear after installation, we’ve posted some fixes related to these issues. Check out the link below. As a reminder, Microsoft warned insider members that initial Creators Update builds will be more buggy than usual. Microsoft’s next major updates Redstone 3 and Redstone 4 are coming in 2017 and 2018.